Morgan Breeden is crowned as Miss West Virginia 2016 by Chelsea Malone, Miss West Virginia 2015. MORGANTOWN, W.Va. — Morgan Breeden, Miss Jefferson County, was crowned Miss West Virginia 2016, and Grace Aulabaugh, Miss Berkeley County’s Outstanding Teen, was named Miss West Virginia’s Outstanding Teen for 2016 as 43 young women from across the state competed for the two crowns Sunday, June 26, at the Metropolitan Theatre. Runners-up for Miss West Virginia’s Outstanding Teen were first runner-up Grace Myers, Miss Northern WV’s OTeen; second runner-up Lindsey Beane, Miss Southern WV’s OTeen; third runner-up Cayton Carder, Miss Doddridge County’s OTeen; and fourth runner-up Kristen Falconi, Miss Wheeling’s OTeen. Runners-up for Miss West Virginia were first runner-up Abigail Harman, Miss Berkely County; second runner-up June Braunlich, Miss Northern West Virginia; third runner-up Bethany Lojewski, Miss Marshall County, and fourth runner-up Katie Rose, Miss Rhododendron. 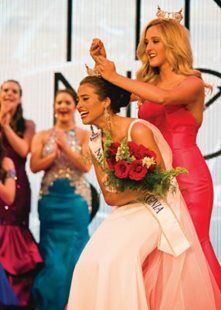 Breeden will go on to compete in the 2017 Miss America Pageant on Sept. 11, in Atlantic City, N.J., and Aulabaugh will compete in Miss America’s Outstanding Teen Pageant on Aug. 2-4 and Aug. 6, in Orlando, Fla.